Den of Geek - Chris Klein makes his proper debut as Cicada as The Flash Season 5 continues! TV Line - Team Flash Meets Season 5's Bug Bad: How'd the First Fight With Cicada Go? pretty decent episode, I'm enjoying dad Flash so far, with added bonus of Joe being father of the year. I feel bad for Cecille losing her powers but that's expected. In case you need it, here's what I managed to capture for Ralph's 27 steps to getting over the love of your life, up to step 18. Here's a clearer one of the top ones up to step 14. [upper right, below title, next to step 1, circled] change is good - and inevitable! 2. Positive affirmations "Ralphie is great. Ralphie is kind. Ralphie is a brilliant detective." 8. Hit the gym - twice a day! So clearly Nora knows all about The Flash's adventures and rogues gallery which means I'm not going to get the scene in which the show twists the knife when Nora introduces Barry to her fiancé from the future, a nice man named Eobard. I think whoever lit and shot the first scene forgot they were doing so for Flash, and instead applied the Arrow-set aesthetic. I was actually excited by the idea of Cisco getting his hair cut. I definitely think he's due for a change, and this would have been the prime opportunity to make one. So does the fact that Cicada was stunned when Nora called Barry dad mean that he's from the future (so knows Nora), is somehow related to Barry (and/or Nora) or something else? That certainly wasn't a throw-away reaction. I was hoping Cecile would keep her powers, but at least they dealt with it in a surprisingly (for this show) mature and adult manner. Oh, I forgot to add, the whole Iris borrowing Barry's lab was so stupid. Just because it's his lab, he can't just giver her permission to use it. I assume there must be some sort of police regulation about who is allowed inside secure areas (and a lab that is processing evidence should darn well be secure) of the police station. And investigating a story should mean more than snooping through police files. I really wish they would drop the whole Iris as a reporter plot because it has always been terrible, she has always been a terrible reporter, and it's nothing but irritating. But she didn't know Barry was in prison, wtf? MUSEUM FAIL. I was surprised that they didn't spend multiple episodes having Barry & Nora keeping his future disappearance secret from Iris, I really did expect them to drag that out for at least a few weeks. Very glad to be wrong. I wouldn't be surprised at all if the prison thing was not mentioned at all in a museum all about The Flash as a hero. I was under the impression that Block had that power all along but psychologically she couldn't stand up to those brothers, her former employers. 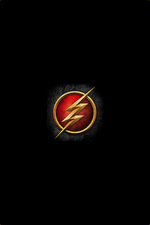 Do we know if the Flash Museum outs Barry Allen as the Flash? Remember that it was Barry that officially went to prison, not the Flash. I wouldn't expect mention of his prison time to be at the museum. Wasn't there some line last episode about the identities of the villains having been scrubbed before their details were put into the museum? So if they protected the bad guys, I'd have to assume they also protected Barry's, especially since the museum director (or whoever) must have been aware he had offspring (who might be vulnerable to time-traveling evil-doers). Someone brought this up in the AV Club discussion but is Jesse L. Martin okay? Two episodes in and they’ve largely just filmed him sitting down and they had Captain Singh at the crime scene instead of Detective West. I read that too, and had no idea what to make of it. Here's hoping he's okay. Iron Heights was a regular prison long before the existence of metahumans was discovered by the world at large. It was mentioned several times in Arrow season 1 and it's also where Barry's father served his time prior to being exonerated. That's where Barry was incarcerated last season as well. I think they mentioned at some point that Iron Heights built a special metahuman wing for imprisoning criminal metas, but otherwise it's a normal prison. True, and they never mentioned when Block got her powers, so she could've been in Iron Heights when the particle accelerator exploded. But was it a women's prison in addition to a men's prison? That's what I was trying to figure out. Metahuman female--stick her in Iron Heights. Metahuman male? Ditto. Regular plain old human male with a serious criminal conviction? Iron Heights. Convicted female felon? No idea, but it seems (based on this episode) Central City has some unique ideas about where and how to house inmates.